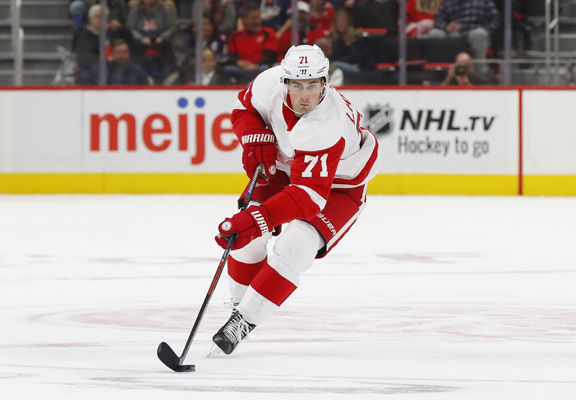 DETROIT — The Carolina Hurricanes dominated Detroit through most of the game, but needed a timely block by defenseman Justin Faulk to beat the Red Wings and snap a three-game losing streak. Faulk, who also scored a goal, made a crucial short-handed block on a shot by Detroit’s Andreas Athanasiou with less than five minutes left and Carolina leading 2-1. Goaltender Petr Mrazek was down and out after making a big save on Frans Nielsen when Athanasiou appeared to have an empty net and a chance to tie the game. Jordan Martinook added an empty-net goal in the final minute to seal Carolina’s 3-1 victory. Michael Ferland scored in his fourth straight game and Sebastian Aho assisted on Ferland’s second-period goal. “That’s 100 percent inexcusable, to not be ready to work, to not be ready to compete at the start of the game through the second period,” Detroit coach Jeff Blashill said. Athanasiou made it 2-1 with 7:58 left when he tapped in a pass from Thomas Vanek.